There are a handful of ways I could introduce today's treat. A solution to the ripe bananas always to be found in the kitchen. 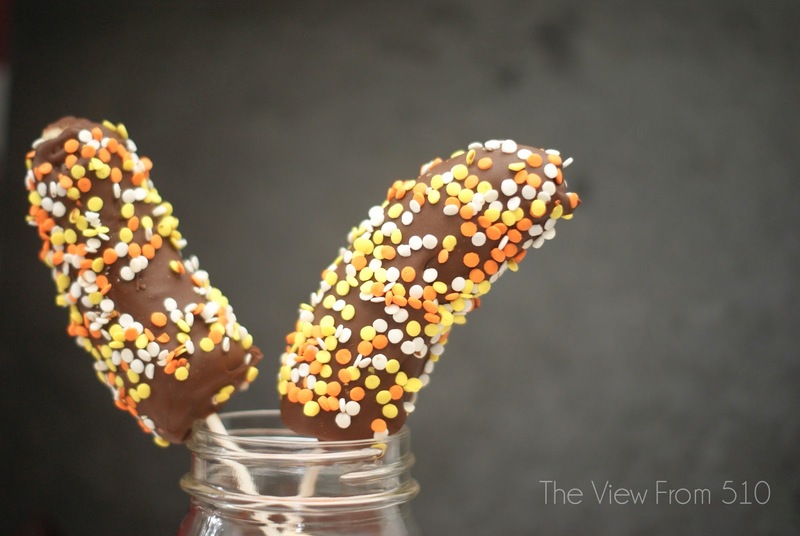 However you label it, these Chocolate-Dipped Bananas are a win! Recently, Jackson's love of bananas hit a low point. His love for chocolate, however, is declared each and every day. A boy after his mama's heart. So, when an event left me with bags upon bags of extra Hershey bars, I knew chocolate-dipped bananas was one recipe we'd definitely be trying in the 510 House! Frozen bananas have been tempting my Pinterest boards all Summer, and with Fall refusing to cool down these were the ideal treat. 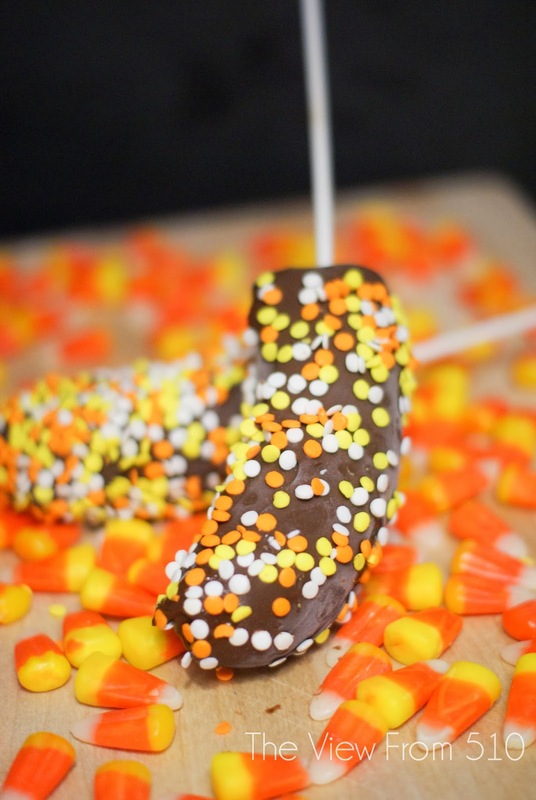 We grabbed some cake pop sticks and halloween themed sprinkles and we were ready! Between me and you, this recipe is best executed with at least one assistant! First up, freeze your bananas on a cookie sheet covered with parchment paper. Once the bananas are frozen and ready for dipping, the chocolate will harden quickly so your toppings need to be ready to go! Grab a few shallow dishes for your toppings, and you'll have a nice afternoon activity with the family. Jackson loved getting his hands in on some melted chocolate and sprinkles. Reminder: have a few extra toppings on hand for tasting toddlers and husbands. It's also good incentive for getting everyone involved. 1. Cover a cookie sheet with parchment paper and set aside. 2. 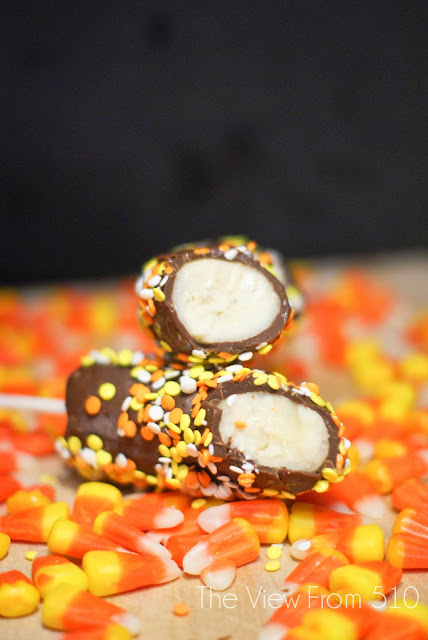 Place a cake pop or popsicle stick into the halved bananas and place on prepared cookie sheet. Freeze for at least one hour. 3. Place toppings into shallow dish. Set aside. 4. Melt chocolate in microwave in 30 second intervals, stirring in between until chocolate is melted. 5. 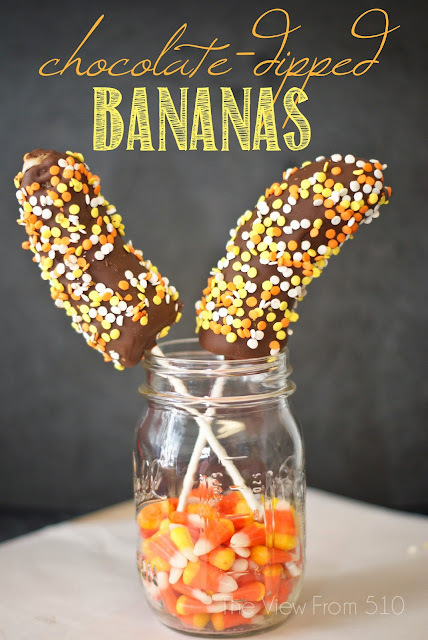 Dip the bananas into chocolate and then toppings. Return to prepared cookie sheet and freeze for at least one hour. Serve when the chocolate has set!